I’ve been trying to get rid of these stupid jerk-bugs for months. These are readily recognized as “long-tailed mealybugs”, Pseudococcus longispinus. 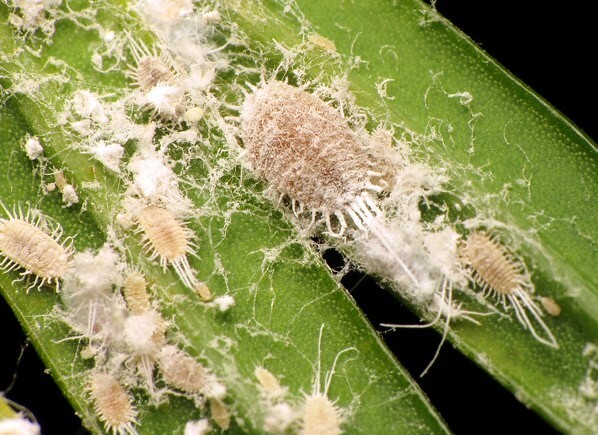 There’s a simple little key to common mealybug pests of house plants here: Key to Mealybugs, which you can use if you find yourself in a similar situation. Because it’s important to know these things if you’re a big geek. Which I am. These images actually provide a fun opportunity to see how far my bug photography has come in the past couple of years. Waaaaaay back in ’09 (before anybody read this blog, except for maybe Ted and my wife) I posted about another mealybug infestation (ironically, also on a plant purchased from Ikea, as this one was. Hmm. But I digress). 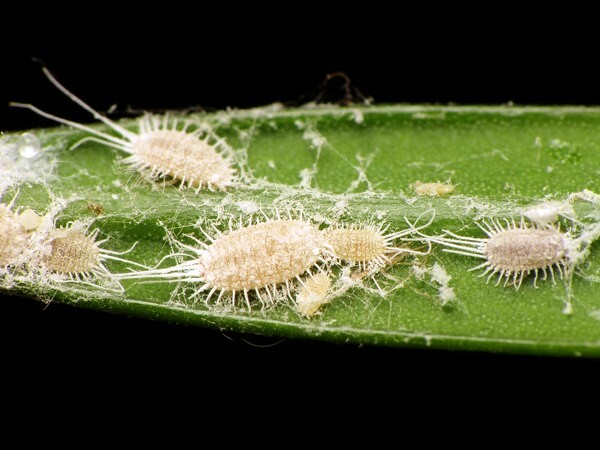 You can see the old post and accompanying image here: “Mealybugs“. That picture (ROFL) was one of my earliest bug photo attempts. It was taken about a month before I got my Raynox macro clip-on, and about 2 years before I got my flash. The before and after represents a little over two years of practice. I think I’m getting better? Awesome pictures! I can’t say I’ve ever taken that close a look at mealybugs before, but I certainly will in the future! As for dealing with them, I think that you can use horticultural oil for mealybugs (you can buy it at Canadian Tire or other such places). I believe that mineral oil might also work. Of course I’ve never been good with plants, so I don’t have first-hand experience with either treatment. I’ve tried the oil. I think it’s because the plant’s base is all knobby and bark-ey and scaly with lots of little nooks and crannies to hide in. Sorry to see your infestation, try horticultural oil, insecticidal soap, or neem oil, they should help. We’ve got lots of aphids, scale insects, and of course mealybugs down here. Carpenter ants don’t help things along, they are actually “herding” all the plant juice sucking insects. I’ve tried a bunch of those things…see my reply to Morgan, above. Ha – serious difference in photos. These are great! Don’t give up hope yet. Take a Q-tip swabbed in alcohol and swipe off as many of the little turds as possible, then religiously (the only context in which I use this word) apply insecticidal soap for at least a month. Not only will this clear up the infestation, but in the meantime the plant will look SHINY! Commiserations to you and the plant. I wipe them with a wet kitchen wipe, made easy because my infestation is on a plant with strappy leaves (Clivia). In the summer I give it a generous shower with a hosepipe outside. This doesn’t remove the infestation completely as it is very difficult to get them from the base of the plant, where the leaves are tight together. But the plant is thriving, blooms once of twice a year and I get to take a look at these weird looking insects. I also got seeds and I now have bug-free 2 yr old plant babies. I haven’t managed a photo as clear and well lit as as yours though. And these critters: white over dark green are hard to shot. Are you getting better? Sure you are! Better luck with your next mealy bug infestation, hoping you don’t get one. Then I wipe down the leaves with paper towel to get any bugs that escaped.